The skeleton of the mill still stands tall and proud, despite the ravages of fire and neglect. Nestled against the old Recreation Hall is a cricket club that has been brought to its knees a few times but is determined to continue. This is one of the most famous patches of land in Irish cricket history. The grass grows, the clubhouse stands and the people remain. Sion Mills Cricket Club; the great survivor. “Welcome to Sion Mills, I’m Simon, captain, groundsman, general dogsbody.” Nobody has a job at this club and everyone wears at least two hats. Stephen Alexander is introduced to me later as the Chairman, another member tells me he’s the Treasurer, talking to him I get the impression he’s a director of coaching. If it needs to be done, it just is at Sion Mills. For that reason, Simon Galloway is cutting the grass before the match and the broken glass and cans were swept away from the seating areas by the players the week before. 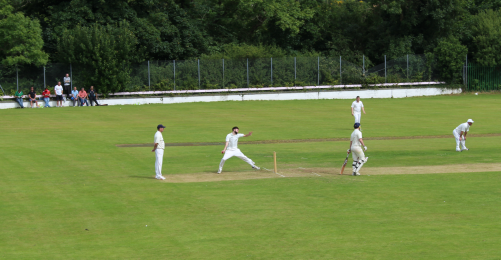 Today they are facing Brigade 2nds in a North West Cricket Union Qualifying League 1 match, there is speculation amongst the players that a promotion play-off might even be in the offing at the end of the season. I’m here because Sion Mills hosted the West Indies and Ireland in 1969 and the Caribbean team are returning to Ireland in September for an ODI at Stormont. Everyone at Sion Mills has a story about 1969 when Ireland bowled the West Indies out for 25 on this famous old ground. The father, uncle or grandfather who played, the man who got off work to come and watch; those but a twinkle in an eye but have heard so much about it they feel like they were there! Simon disappears to collect a few players, the joy of captaincy, but it has got to be done. For the team, for the club, for the village. Sion Mills bat first and despite Ryan O’Neill going early, they are 44/2 off 10. Simon Galloway comes in at 4 for a break after all the off-field duties he’s had already. He stays in for 43 minutes and 6 singles before being caught behind. He’s been giving the strike to Mark McNulty who’s on his way to a classy 52. McNulty smashes three 6s and six 4s on his way to his half-century, a brilliant knock. Lee Finlay, coming in at number 7, shot to 26*, including 3 maximums, in no time at all. Both Finlay and McNulty clubbed sixes up to the old railway line. I was told of the maximum that burst through a passing train carriage and was carried all the way to Derry for the longest 6 in North West history, well either man here had the requisite power to repeat the trick. Pity the train line is no more, it’s not the only thing off the field in Sion Mills to have gone by the wayside. The original pavilion is gone too. The latest pavilion lacks some welcoming touches but the people more than make up for that. Jim McGranaghan comes in to bat at number 9, he’s enjoyed a laugh and a joke all day but now the game face is on. His first shot in anger is a massive 6 into the higher branches of an overhanging tree. The young Brigade lad underneath tentatively asks what would happen if he caught the ball off the tree but is drowned out by the adoring fan club cheering this big hit. Before Tea, the Brigade openers face a tricky spell and John Havern nips in with a great delivery, clean bowling Waterstone for 4. He has a unique style and he certainly won’t get called for any no-balls as he lands way behind the stumps. Tight bowling by Havern (1-13) and Lee McGonigle up front means the Brigade chase never has a chance to get started. McGonigle goes for just 10 runs off his 6 overs picking up the wicket of Orr for 0 too. Ryan O’Neill was the man in the right place twice in quick succession to take excellent catches before Craig Alexander came on to mop up the tail, taking 3-9 in 4.5 overs. In truth a young Brigade team never really got into the chase, through the tight bowling and energetic fielding of a keen Sion Mills side. Every wicket was celebrated in fine style by the players and spectators alike. This is a club that, although not where it used to be, is being overseen by a dedicated, hardworking band of players and volunteers. It’s vital for the village and the people of Sion Mills to have a vibrant cricket club. There are good young cricketers, experienced campaigners with lessons to share and volunteers giving of their time. Mark McNulty stood out for his 52 and 3 wickets but Rian McKelvey and Craig Alexander look like top talents and the triumvirate of McGranaghan, Damien O’Neill and McGonigle have plenty of experience and nous to pass on. In 2019, the ICC World Cup will be staged in England and Wales. In 2019, it will be 50 years since Ireland defeated the West Indies at Sion Mills. There are a multitude of reasons Sion Mills “has to keep going” but one is definitely the possibility of a visit or training session by the West Indies to mark the 50th anniversary of Ireland bowling them out for 25 when Sion Mills was the epicentre of Irish cricket.